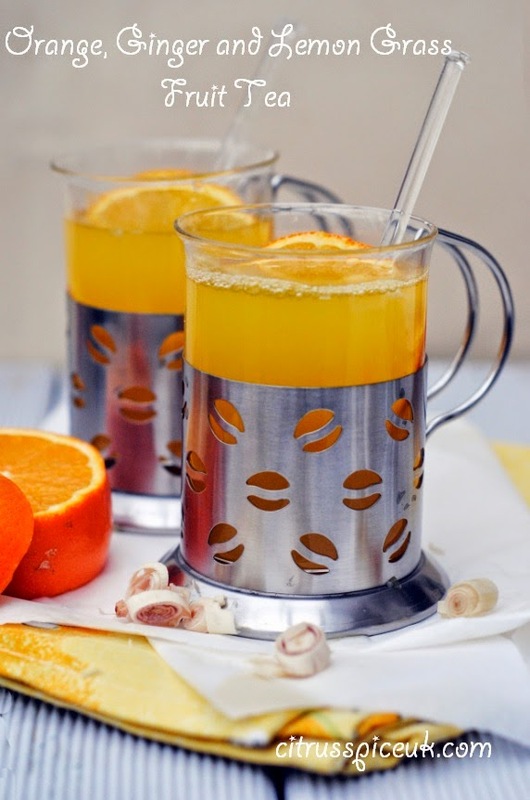 A clensing and healthy juice to kickstart your day. 1.Wash the plums and cut them in half and remove the stones.Put the plums in a bowl.2.Core the apple and keeping the skin on, cut the apple into chunks and put in the the bowl .3.Peel the beetroot and cut it into chunks and add it to the bowl.4.Add all the fruit into the Optimum 600 juicer and extract the juice, Once all the fruit has been juiced, taste it and if required add some agave necter to sweeten it. 5.Add the icecubes to two tall glasses and pour the juice into the glasses, serve immediately. 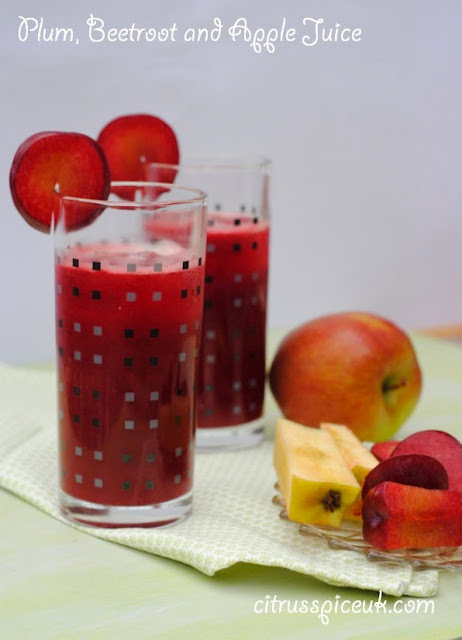 I made my Plum, Beetroot and Apple Juice in the optimum 600 juicer. To read about the Optimum 600 juicer check my review post here. 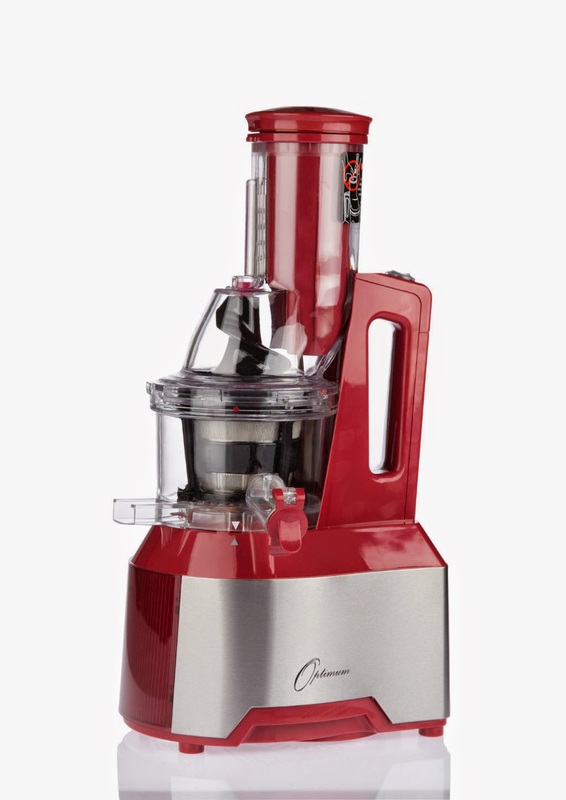 The Optimum 600 juicer juices whole fruits and vegetables with no food prep required! Exciting news is that the Optimum 600 is currently on a special offer at a discounted price of £249, it normally retails at £329.00 if you would like to purchase an Optimum 600 juicer at this special price, please click here. I was given the Optimum 600 juicer to use in my kitchen , I was not asked to write a positive review. 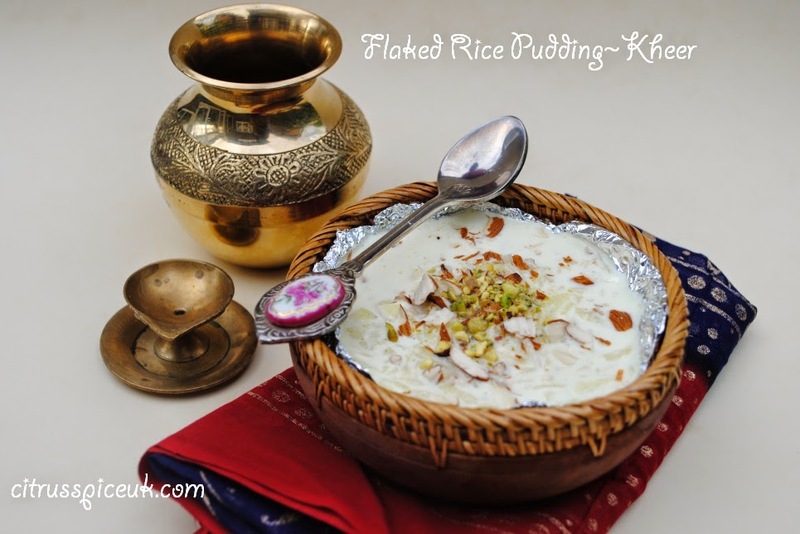 Rice pudding is a very popular Indian dessert that is served at religiousfestivals and as prasad- a sweet offering to the dieties. 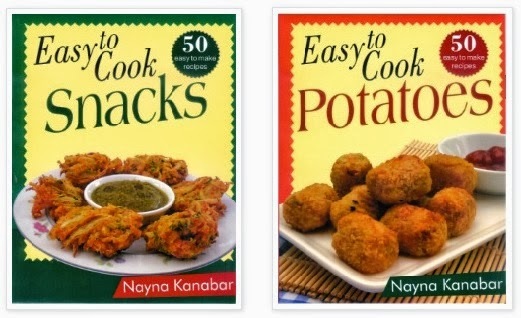 It can be made from short grain rice or flaked rice. 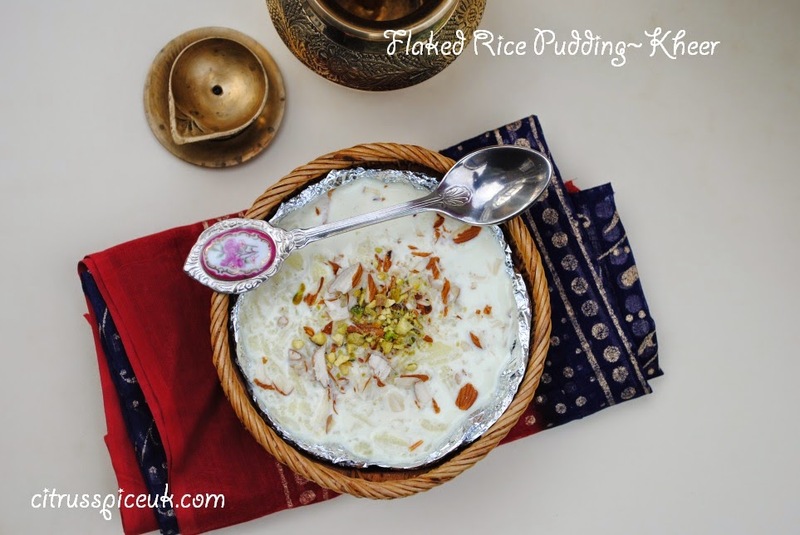 In todays post I have made my Kheer using flaked rice and adding traditional Indian spices such as saffron, cardamom and nutmeg. 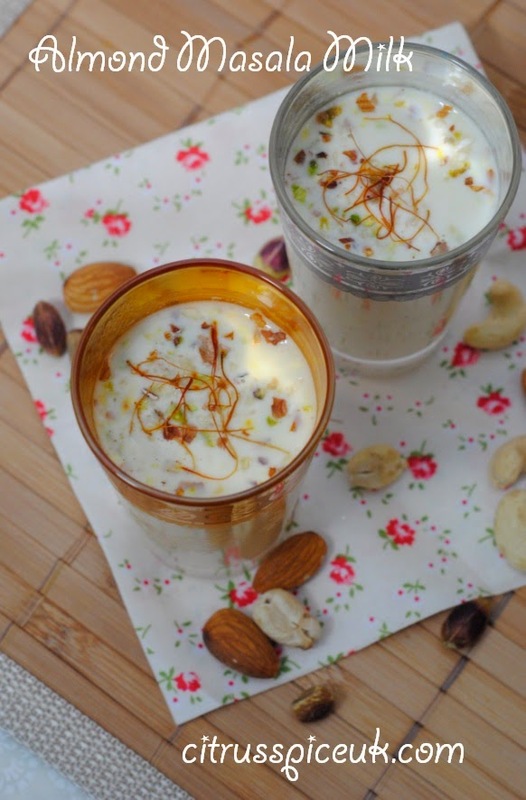 Creamy rich flaked rice pudding cooked with fragrant Indian spices and nuts. 1.In a heavy bottomed pan, pour the milk and bring it to a slow simmer. 2.Put the flaked rice in a large sieve and rinse them under cold water.3.Add the rinsed flaked rice to the milk and simmer the milk until the flaked rice is soft, it will takeabout 8 minutes.4. Add the condensed milk to the pan and simmer for 2-3 minutes longer .5.Slice the the nuts and keep them aside.6. Add a few strands of saffron, half the nuts, cardamom powder, nutmeg into the rice pudding and stir together 8.Take the rice pudding off the heat and transfer to a serving bowl , garnish with remaining nuts. 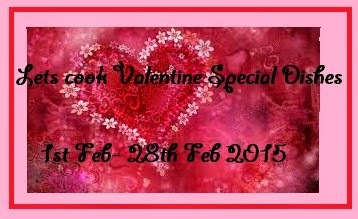 Lets Cook special valentine dishes , event by simplyfood. 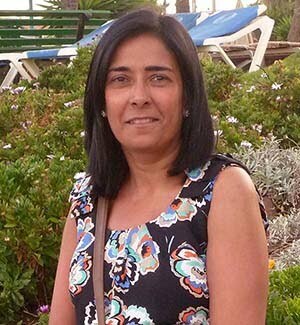 The Stitching, Sewing & Hobbycrafts show with the popular Fashion and Embroidery element will take place at the ExCeL, London from the 27-29 March 2015. Creative crafters and savvy stitchers will be in sewing heaven in the Stitching, Sewing & Hobbycrafts aisles. Over 100 exhibitors from across the UK will gather at the ExCeL, London to showcase their wares and supplies, share advice and offer inspiration to those looking to embark on their next creative project. ICHF have been very generous and again this year they have agreed to provide tickets for citrusspice readers. At citrusspiceuk I have 1 pair of tickets each for 5 lucky winners to attend this amazing show. 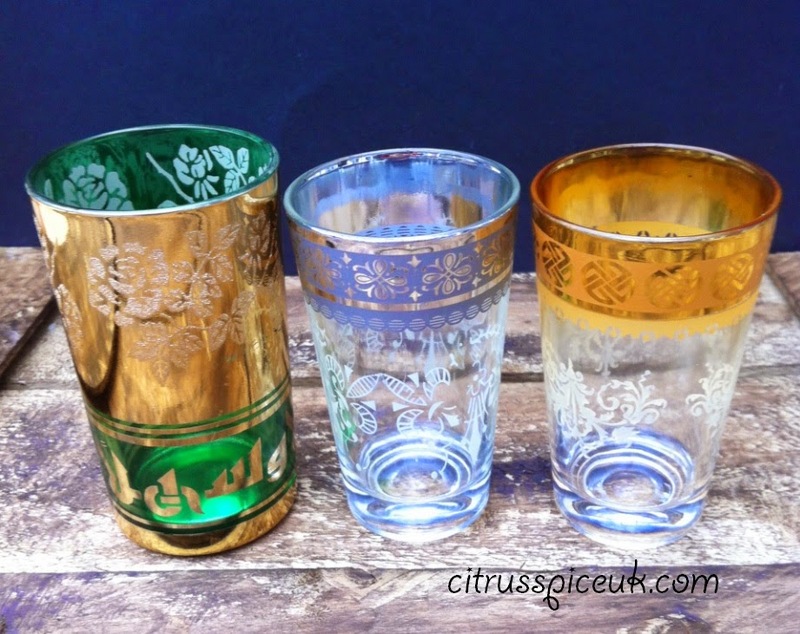 Middle Eastern glasses an addition to my blog props. From time to time I love sharing how I come about obtaining some of my props for food photography. There is never a time when my eyes are not looking out for props whilst I am out and about, window shopping, at a restaurant or at a charity shop . This is an obsession and I just can't stop it. Some time ago I went out with a group of work mates to a Lebanese restaurant for a meal. The restaurant was very ethnic with beautiful authentic rugs hanging on the walls and had a very middle Eastern Decor and ambience. The food was amazing and it was served in the lovely hand painted pottery, plates and bowls. 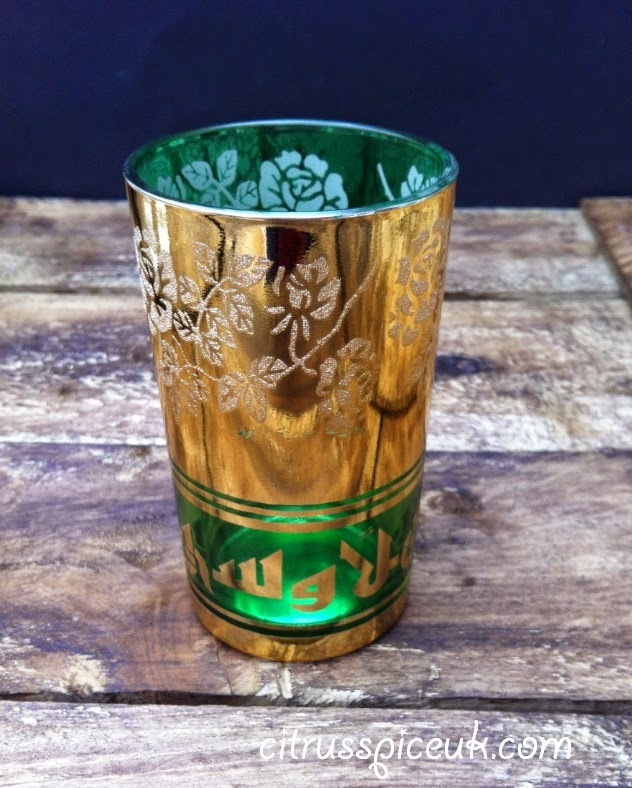 But what really caught my eye was the lovely green and gold and silver rimmed glasses they used to serve the tea in. They were so pretty that all evening I had my eyes on them and couldn't stop admiring them. The meal was over and we left the restaurant, although I was now on the look out for the pretty glasses I had seen.I googled the glasses but most came in sets and since all my blog props are only for photography it seemed a little bit extravagant to buy a whole set when I only needed one or two. My sensible side decided that I wil not purchase them and the thought was put at the back of my mind. A few weeks later, while I was at work a collegue who knows about my prop obsession handed me a white paper bag, the type that restaurants put your takeaway in. I opened it thinking she had chosen to share her doggy bag from her previous nights meal for my lunch!!! To my enormous surprise, wrapped in serviettes were the three glasses I had my eyes on from the Lebanese restaurant. My friend had been to the same place for a meal and somehow managed to persuade the owner to give her the glasses for me. I was overjoyed and couldn't wait to use them in a photo shoot. 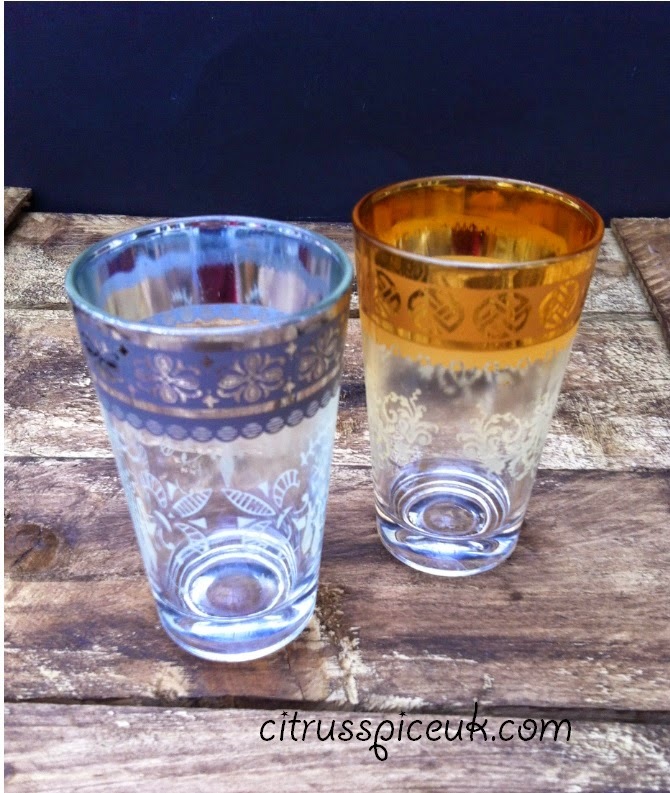 Here is a picture of the two glasses in my Almond masala milk recipe. Arn't they just gorgeous. I absolutely love the intricut gold and silver trim with the in lay design on the rim. 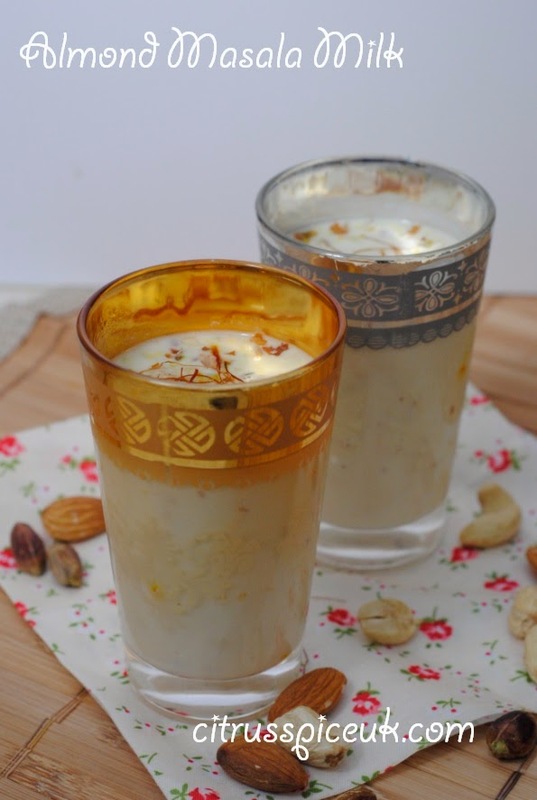 Masala Milk is a very popular milk drink served at weddings and special occasions all over India.It is a milk drink made from full fat dairy milk which is boiled and reduced and than enchriched with spices nuts and saffron. It can be served hot or cold. I have given this traditional drink a twist by making it with almond milk. I made my Almond milk in the The Optimum 9400 blender which was sent to me by Froothie to try out, you can see the original review here. All the views of the Optimum 9400 are of my own experience of the blender and totally honest and unbiased. It is available to buy at £329.00, It comes with a 1 MONTH TRIAL - MONEY BACK GUARANTEE (includes return postage costs for UK customers) Currently it is available on special offer only £299 for a limited time using your launch special intro coupon type intro30GBP. 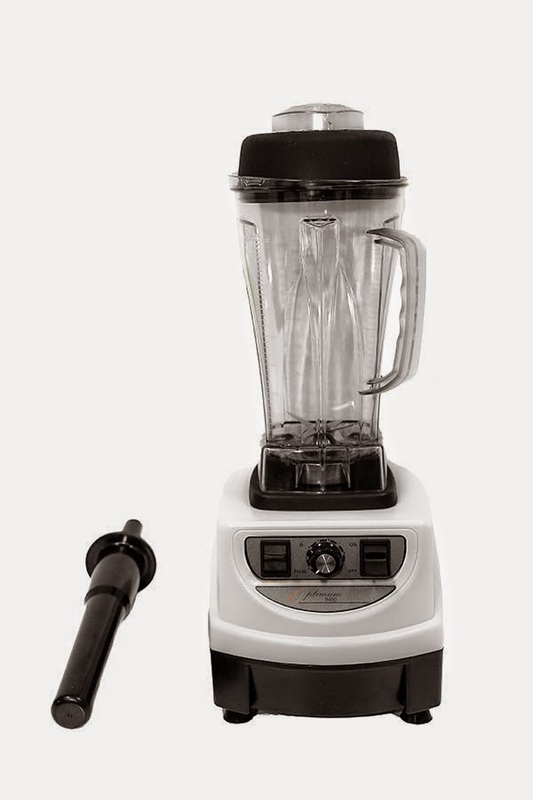 If you like the sound of this awesome blender, please orders it through here. 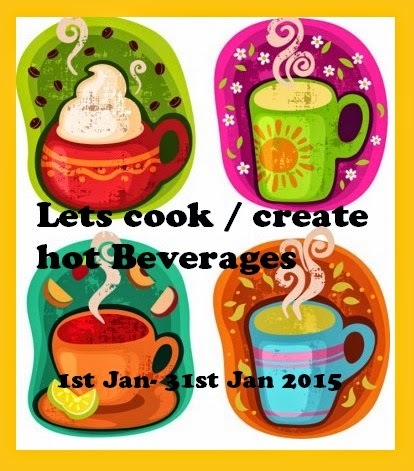 Lets cook/create hot beverages event by simplyfood. Hobbycraft show returns to NEC once again. It is a Craft lovers haven where they can enjoy a variety of demonstrations and workshops on offer including the lively on-stand demos. Exhibitors will be presenting new ideas, methods and the latest paper crafting and card making supplies to make stylish, personalised crafts.With everything from sewing, knitting and quilting to papercraft, cardmaking and jewellery making, you will find all the latest innovations from the world of creative craft. What's more, all visitors can enjoy a free programme of Quick & Easy Workshops, Talks and Demonstrations each day of the show.